While art enthusiasts around the world are lining up to see the newly authenticated Vincent Van Gogh painting, the Elks prefer to support local artists in need. Using an Elks National Foundation Gratitude Grant, Anniston, Ala., Lodge No. 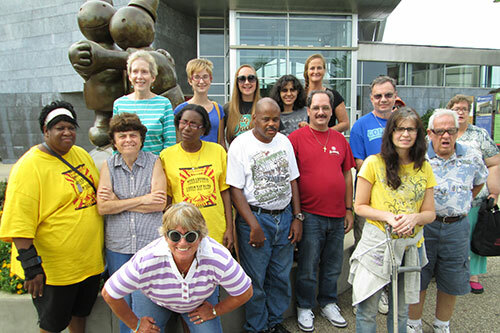 189 partnered with The Arc—an organization that serves people with special needs—to provide group art classes. 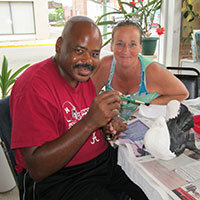 The arts program at the local Arc was suffering due to funding cuts. Thanks to the Gratitude Grant, Elks provided frames, paint, canvases and other supplies and immediately put them to good use as they assisted the artists in their weekly classes. After mastering the art of painting, the Elks and the artists took ceramics classes and produced more museum-worthy pieces. To see where their art may one day hang, the Elks took the art class to the Hunter Museum of Art in Chattanooga, Tenn.